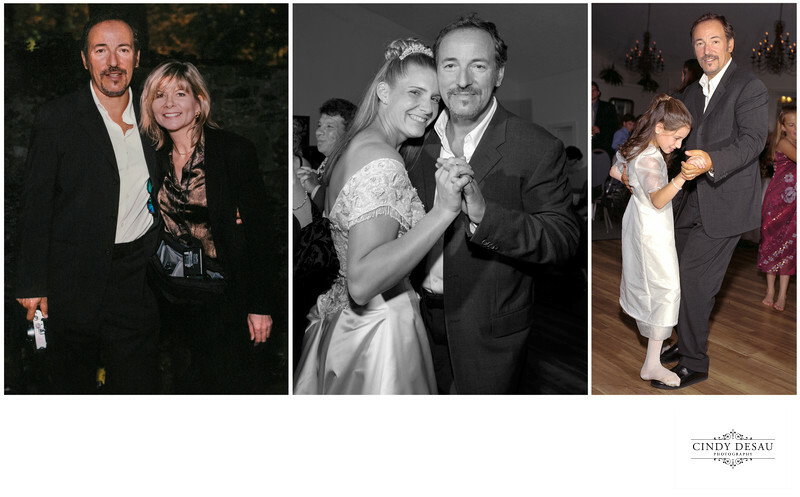 Bruce Springsteen worked a wedding with me. Well, not really, but he did bring his camera. The Boss, who was friends with both the bride and groom, was actually a guest at a wedding I photographed at Holly Hedge Estate in New Hope, Pa.
Bruce was happy to mingle with other guests, and thanks to his rabid interest in photography I had the chance to chat with him. He told me he liked to take landscape photos on his property in New Jersey. During the reception, he had a dance with the bride, and some slow dances with daughter Jessica, who stood on his shoes as they danced. I think a lot of the guests were hoping he would sing, but he left the music up to the band that was hired, The Franklin and Alison Orchestra. Photo of me with Bruce by Kevin Shea.